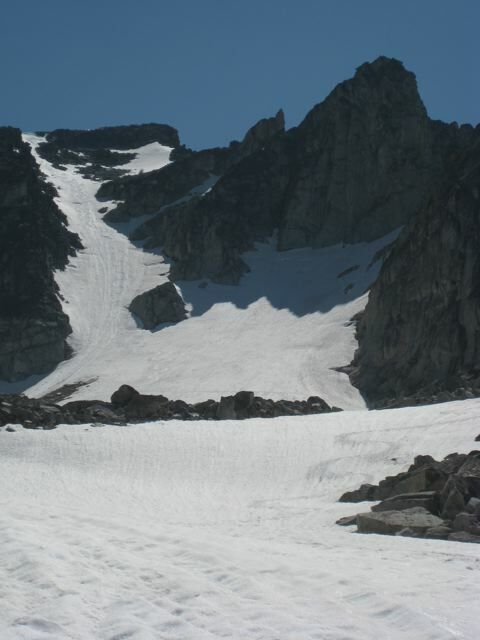 I received a couple great trip reports this late June from two of Western Montana’s iconic ski peaks, Trapper Peak in the Bitterroots and Grey Wolf Peak in the Mission Mountains. 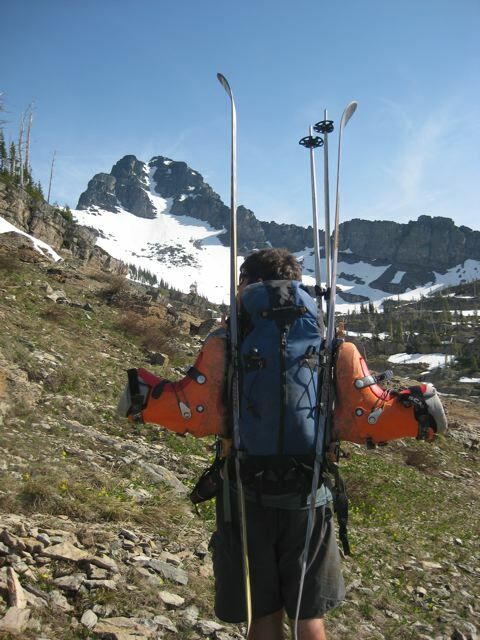 Trapper is the highest peak in the Bitterroots and one with the best access as well as terrain. 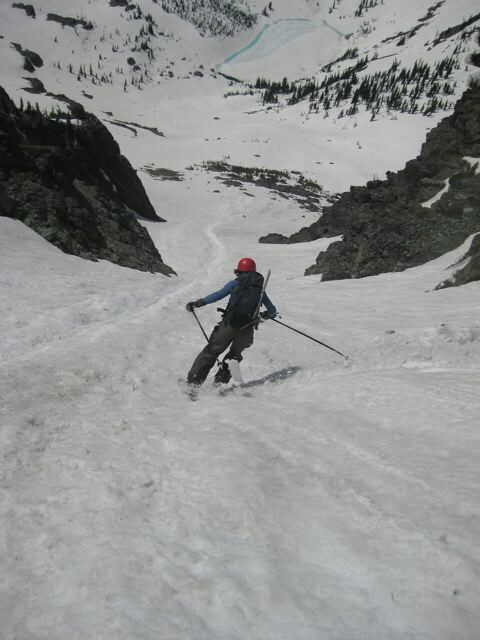 Grey Wolf is a more difficult peak to access as well as ski, and is well worth the trip. Remember your tribal permit if recreating on the Flathead Reservation. There is currently a closure as well in place for MacDonald Peak and the Grizzly Bear Conservation Area all around its massive flanks. Inquire locally about the travel restriction there. 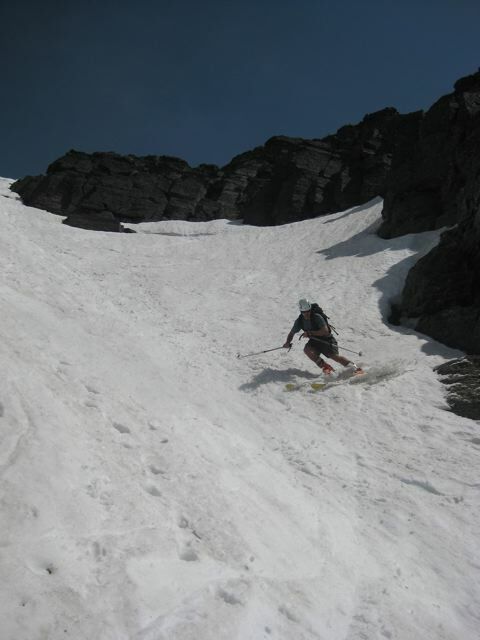 I thought it would be fun to post some more photos from the ski days that I missed here on the day before July. I joined Bill Bradt’s early season run down the Middle Fork Salmon River for a spectacular week of boating with a remarkable group of young guns and seasoned river rats. We launched from 2 foot snowbanks on Sunday in perfect weather off the bridge west of Stanley to gain access to Marsh creek and the Middle beyond. Not for the fairweather boaters. Cold water and snowbanks made the sunshine that much more sweet. 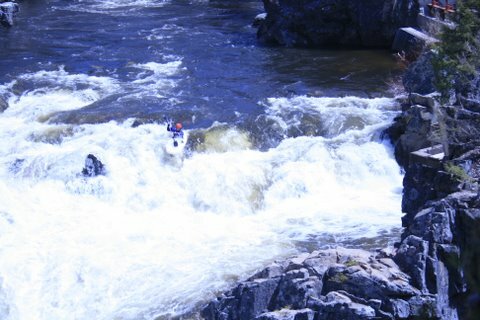 Day one was shallow with constant work freeing the cataraft from hangups. The rafts had no troubles by comparison and Jesse and Wooly shared the hard labor freeing the cataraft regularly. We camped just upstream of the first serious rapid, where disaster struck five years ago and a good friend to many of this party drowned. 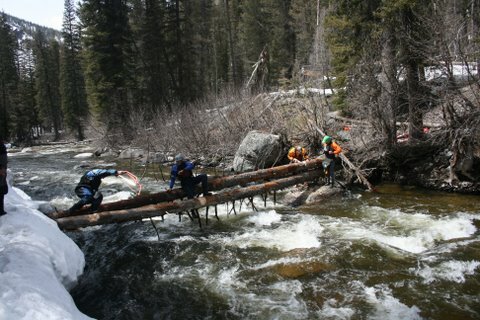 With much lower water this year, the group was able to pass by this obstacle without trouble. We did encounter two log jams on the upper river and the kayak probes bearing saws cleared them out and managed to create bypass channels. There were three logs in this jam which eventually was taken out by bow saw, axe and muscle power. 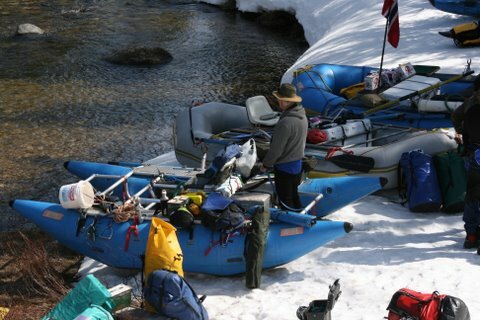 By the second day we were into the bigger water and the confluence creating the Middle Fork proper. We stopped there for a patch job on one of the rafts and then pushed on to Dagger Falls which many of the party ran including all threee rafts and where we had two swimmers and our only injury of the trip. While swimming Jim hit a rock with his thigh and it bruised quite badly. Super game, he smiled, smoked a cigarette and rode a raft. 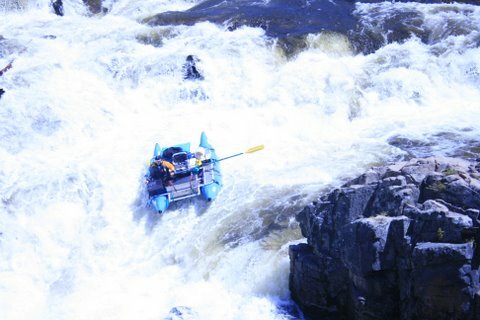 Dagger Falls is the most intimidating feature on the river and once we cleared this obstacle and the adrenalin flush it created the rest of the river was usually relaxing. TJ keeping his cool in the runout. John Lehrman hits the lucky line. Got the goods through safely. Below Dagger Falls we had made the elevation drop to be completely out of the snow and we enjoyed a easy trip downstream to Sheepeater Hot Springs for the night. With hot water to soak in and a great dinner on the grassy bar we savored what is best with river life. 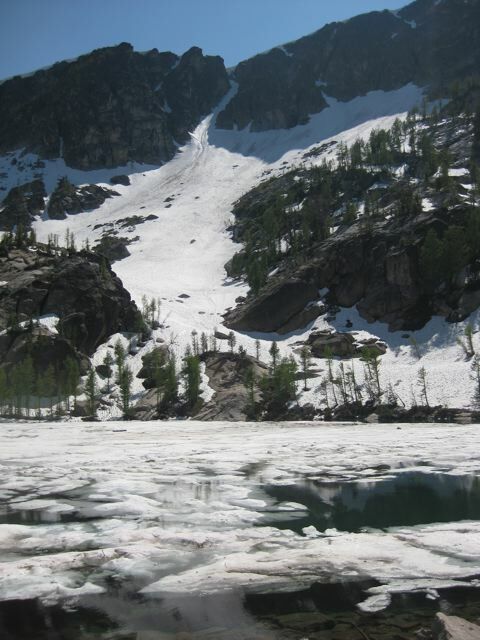 By the next morning the weather had become unstable and we felt six snow showers throughout the day alternating with strong sunshine and a downriver wind. Bundled up with more clothes on under the dry suit than for any activity other than riding a chair lift, I felt a bit bulky but stayed very comfortable all day. The rapids all blend into a delightful stream of paying attention and finding lines and relaxing into the flow of a river flushing snowmelt. Moving about five miles an hour, it was possible to make some miles on the river, just by staying in the current. We stopped at SunFlower Hot Springs for the night and had another dose of hot water and snowsqualls to keep the energy high. I had my best tentsite of the trip tucked between two fat Ponderosas and staring down river. It was a good day of mostly moderate water from Sunflower to Hospital Bar where we celebrated Bill’s birthday with Wildcat, Mountain Lion Stew his grandson had arrowed from a tree last winter. Umm good and another night of soaking up the springs in the kiddie Pool. With a belly full of Tequila we had a touch of the wild hair that night….thanks Bill, in true form for a stoic Norwegian. Mountain sheep kept watch over us at that camp as they grazed the bottom land and shed their winter’s coat, looking ragged but acting alert and healthy. Jesse and I made the long walk for Douglas Fir firewood that day and it paid off with a nice piece of wood for the firepan, where we were gathering for stories, cooking and staring at man’s great discoveries. What joy to be amongst a clan of riverrunners staring into the flames and listening and sharing stories from the day and from the years passed, with an eye for the future and hopes to keep getting out on great trips like this. We split groups the next day with some of us making the move to Stoddard camp while others laid over for the day. 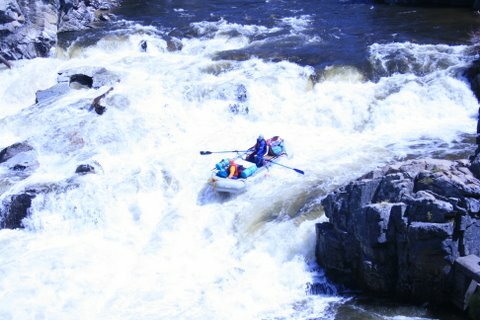 We left light and early and made the forty five miles in a solid eight hours, running cleanly down through numerous rapids and enjoying the lower canyon as the water became more exciting and the boulders choking its course became larger. 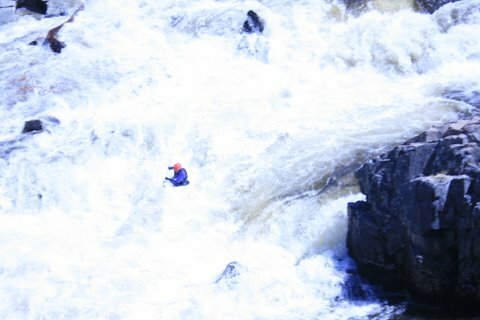 I was rolled finally in a seam I was not expecting and took care to preserve my strength for this endurance day downstream. Stoddard creek has some remarkable pictographs on a beautful granite wall, and we hiked to and lay in front meditating on the ancient tales told by winter’s night deep in this canyon when the people talked to the animals and fish and had a profound connection to the land, on a day to day and ground to mouth type of way. While they nust have eaten fish most of the paintings were of large ungulates, elk, sheep and moose. 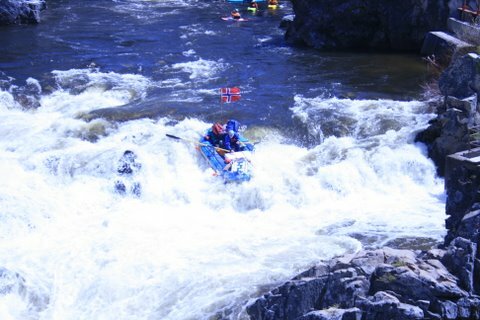 The final day was short and included some classic rapids like Rubber with its deep and frothy wave train no weakness save right down the middle. Before we knew it the Main Stem was upon us and we were headed back to the Bitterroot Valley.